With trust in many institutions taking a nosedive and few people having confidence in our business and governmental leaders, the concept of radical transparency has been mooted as a remedy to these problems. So just what is this radical idea? Is it the equivalent of ‘Greenwashing’, but only for the recessionary age? Or does it promise to be a mantra for 21st Century business? Wikipedia offers up as good a definition as any: ‘radical transparency is a phrase used across fields of governance, politics, software design and business to describe actions and approaches that radically increase the openness of organizational process and data. But asking for our leaders and institutions to be more transparent is nothing new. Back in 2007 Wired magazine ran a feature called ‘The See-Through CEO’ looking at this topic in detail. During periods of economic prosperity, it’s clear we are willing to trust business to do the right thing, so long as they remain profitable, provide employment and treat staff well. Whereas, the economic crisis has caused us to trust business less, want to know more and look favourably upon increased regulation. If you’re still wondering how radical transparency can and should be applied in everyday life, check out this video from Moz (formerly SEOMoz). They’re a Seattle-based outfit (I’ve just spent a week holidaying there) and the video is about a year old, but that doesn’t make its content any less impactful. SEOmoz on Radical Transparency in Business from Dan McComb on Vimeo. 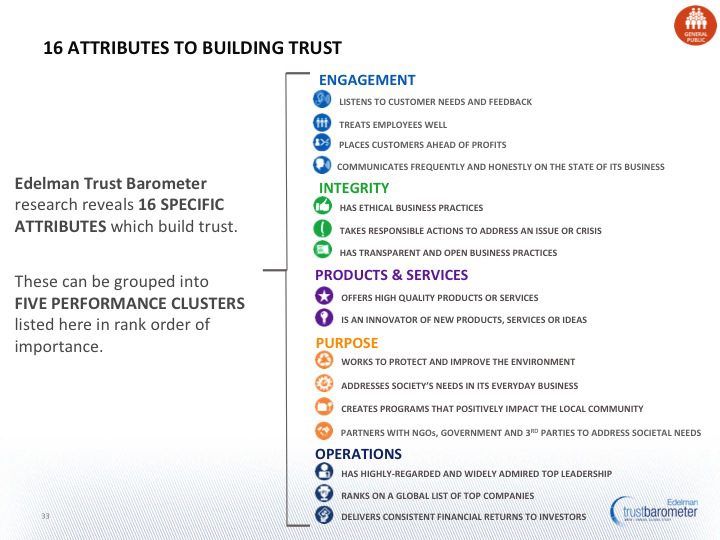 Radical transparency is intricately linked to trust and you’ll see from the table below that Edelman have identified 16 attributes that are key builders of trust. You also notice that they’re a combination of business (products & services and operations) and societal objectives (engagement, integrity and purpose). Interestingly, there are more societal objectives. This is hugely significant. Focussing on business goals is no longer enough, businesses need to establish both operational and societal objectives. If you take a look at both engagement and integrity, all of these clusters are closely aligned with radical transparency and that’s why organisations are now being challenged to practice it. But few organisations truly operate in a radically transparent way. This will take time and requires a new approach, but there are some noteworthy examples. For instance, at times of crisis, many organisations adopt a short-term view and seek to keep information inside the organisation. However, the sooner you begin communicating in a open, honest and transparent way, the sooner you can begin to repair the reputational damage. Times of crisis can be also be one of opportunity. Dr. Rory Knight and Dr. Deborah Pretty from University of Oxford found that organisations which recover from crisis can add 5% to their original stock value. But those which do not, remain more or less unchanged for five and 50 days after the crisis, but suffer a loss of 15% on their share price up to a year later. An open culture and practising radical transparency can be the insurance policy that your reputation needs. Not only does radical transparency make sense from a communications perspective, there are wider business benefits too. Qualtrics, a data collection and analysis software company are a shining example of a company that has used radical transparency to increase operational performance by giving everyone access to each other’s performance data, which is then linked to salary, bonus and career progression. Seemingly, another way to practice radical transparency and increase operational efficiency is publishing the price of your products. This may sound obvious for those in consumer markets, but professional services and consultancies often keep their prices hidden. All this begs the question, just how transparent are we willing to be? 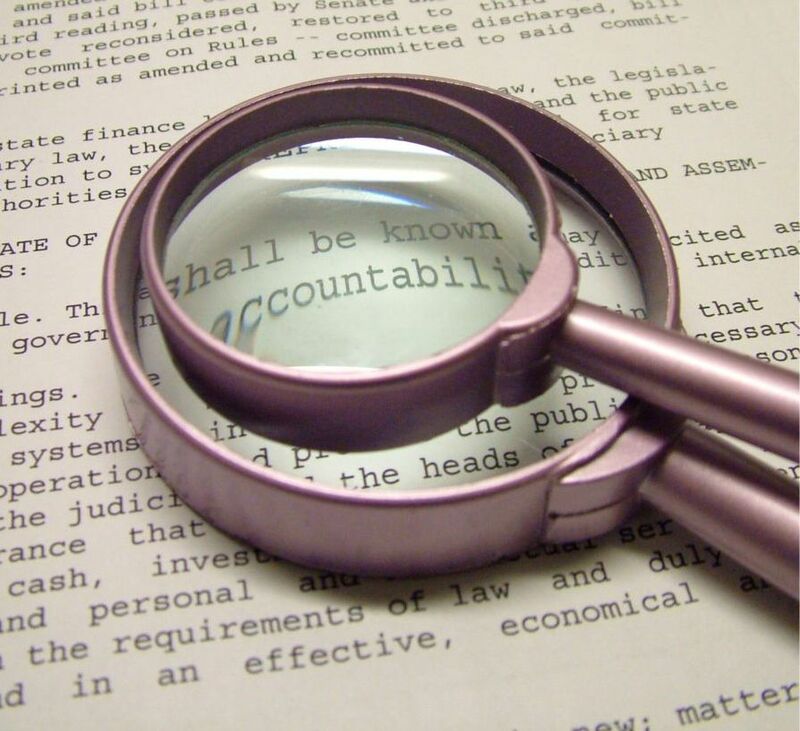 We’re currently living in a period with unprecedented levels of scrutiny, and while some businesses struggle to cope under the glare of transparency, the best piece of communications advice remains to simply do the right thing.